For years, I've been under the illusion that I don't need to use eye cream. I thought that a moisturizer was enough to, literally, cover all of my facial needs. Alas, as the fine lines creeping around the corners of my eyes can attest, I was mistaken. 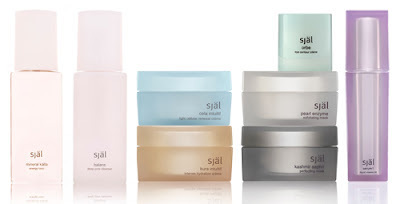 Sjal (Swedish for spirit, mind, heart and soul) is a luxury skincare line that melds Western science with an Eastern infusion of precious minerals and gemstones to increase celullar productivity, performance and repair and enhance the skin. Kristin Petrovich, creator of sjal, has a few tips for Everything She Wants' readers on the benefits of eye cream. When should women start using eye cream? Kristin Petrovich: Mid-to-late twenties to help protect, preserve and begin correcting any early signs of aging. Why is it important to use an eye cream around your eyes instead of a regular moisturizer? KP: Eye creams are specifically formulated for the eye area. Typically, they are more gentle and have better penetration into the delicate eye area and address specific areas of concern (elasticity, dark circles, hydration, etc). How often should women apply eye cream and when? KP: Day and night, around the orbital eye area. How does sjal's eye cream differ from other brands? What are the benefits? KP: sjal’s orbe is a multi-tasking all-in-one eye cream containing 50 active ingredients. A small amount goes a very long way. It focuses on toning, lifting, brightening and softening of fine lines and wrinkles. It easily penetrates and is non-greasy. It contains prolines, a type of amino acid which naturally occurs around the eye area. These prolines help to work on tone and elasticity and over-time break down any fatty deposits and naturally helps to stimulate one’s own prolines around the eye area. Additionally, the eye cream contains a balanced moisture magnet which works according to your skin’s transdermal water loss (TWL). For example, if you are in a desert, it will literally draw moisture in from the air into the eye area.